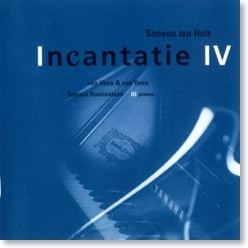 Incantatie IV is a melodious and orchestral repetitive piece for several keyboard instruments. Left free by the composer on certain aspects of the composition, like timbre and pitch, style of play and tempo, number of voices or instruments, and number of times certain parts are repeated, the final form is decided upon on stage by the performers.. The length of the composition is undetermined. This music exists in a gray area between composed and improvised music. Ten Holt comments: "Although there is a score with prescribed notes, the performer can still decide when these notes will turn into sound. Where notes appear there might be a silence, on the other hand the score might show no notes, and yet there can be sound." The composition is divided into seven sections, uninterruptedly flowing into each other. Jeroen van Veen says: "The music sounds as if looking at the sea for a long time; the waves, the rays of sunshine and the air all influence the glittering and different colors of the sea. Characteristic for this spectrum of changing possibilities is continuous motion like a perpetual mobile." This composition can therefore be regarded as Work in Progress.